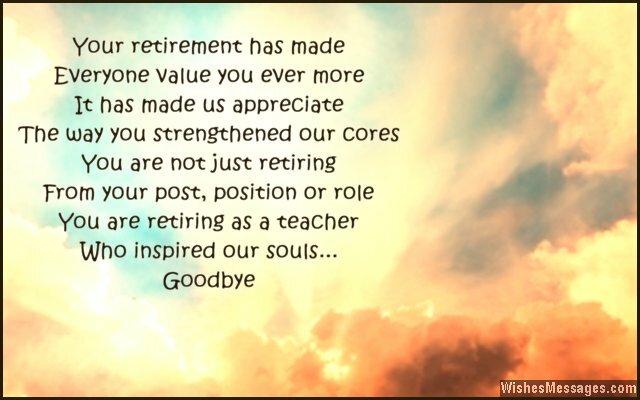 Retirement Poems for Teacher: Your favorite teacher’s retirement is a chance to convey how much you have loved being his or her student. Regardless of whether you want to say congratulations with a happy smile or give a tearful farewell, take ideas from this post to write rhymes that will make for the perfect goodbye. Scribble your cute little poem on a handmade card. You can even post in on your teacher’s Facebook. Such sweet notes from students and colleagues go on to become lifelong keepsakes that teachers hold on to dearly. Teaching is a thankless profession and good teachers are hard to come by. Go on, make your teacher’s retirement the perfect ending to an inspirational life story dedicated to making the world a better place, one student at a time.